The central focus of the seventh BRICS summit in Ufa has been the New Development Bank, a creation of the five member states. 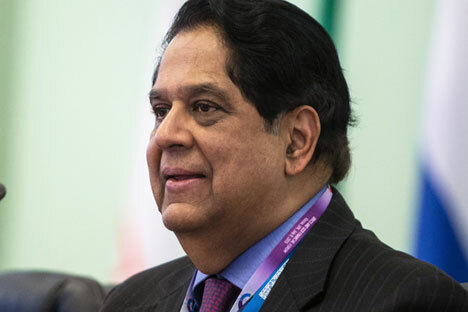 In an exclusive interview with TASS the new Bank’s chief, Kundapur Vaman Kamath said the Bank has to hire a team, launch internal procedures and compile a list of potential investment projects. How will the balance of power be observed in the NDB? All founder-members will come together in equal shareholding, so everything is on an equal basis in terms of the board. As far as the operations of the bank are concerned, we are open to business and we will look at proposals from each country. And they will be looked at in the sequence in which they are coming. We realize we will need to work with other partners, to meet aspirations in terms of loans and other assistance for not only our BRICS member-countries as of now, but an increased number of members as it happens, so that will be laid out in our policy as we go along. Correct me if I’m wrong. The current charter capital is $100 bln. There were also reports there will be a limit of $34 bln per year of investment funding. Is that correct? Not to my knowledge, I don’t think we will have any number. What will determine the amount we lend per year is our ability to identify projects we could fund, and will to raise funding for those projects. That would be the sequence. Because you have to maintain your credit rating and you have to maintain your leverage between equity and debt. That will determine the annual lending [volume]. So there will be both equity financing and debt financing? Yes. See, there will be both equity raising by us, which is from the member-states, and debt raising by us from the markets. And we will also lend to our customers, the various countries or the projects in those countries, in equity and in debt. If you have a charter capital of $100 bln, how much virtually could you spend on investment projects with a long return? Long-term lending follows this model: you have your parent capital, and you can leverage that typically two to three times as debt. So you then have if you fully bring in your parent capital you have another $200-300 bln over that, so you could do $300-400 bln worth of lending. That will happen over a period of time. At this point I cannot say how quickly, because that will depend on how quickly we will set ourselves up and how quickly we will build our project pipeline with various countries. What is the roadmap for creating the corporate structure of your bank? It is underway. It’s a ratification process whereby the various government entities, nations come together and set this up, that process is complete, that’s the first step. That board meeting took place in Moscow [on July 7 – TASS]. As of now, technically I have a white sheet of paper with only the names of my four vice-presidents. Everybody else has to be hired. But our friends in China have given us office space, they’ve already furnished it, so we can move into our offices next week, which we are. So typically that takes time, but it our case it’s ready, we’re moving into our office. And we are in the process of recruiting. To cut a long story short, typically this takes a lot of time to set up, but what we want to do is by April next year we want to make our first loans, so we will have to build teams to identify projects, build simultaneously internal processes and procedures, hire people and then get to the funding process. Are you planning to hire your team on a basis of national quotas from the members, or professional qualities? I think it’s very simple. For the first three months we will seek help from member-country institutions: the local development banks, local banks. So I’ve started the process of consulting with our own development bank partners, in fact I was having meetings just now, to hire 1-2-3 people from each of the countries. These are the people who will help in starting. For example we need to set up our HR processes, and then we will recruit. Recruitment will be purely merit-based from across our member-countries. As far as the projects are concerned, many countries have already expressed their interest in presenting some particular projects to your bank. For example, Russia’s Finance Minister said oil company Rosneft could be interested in attracting money from your bank, or Russian Railways. Do you have any projects in mind already? We have asked every country by now to suggest a pipeline of projects. In some places it is at the ministerial level that we’ve asked, in others – at the national development bank level that we’ve asked to share with us the projects that we could do by ourselves or jointly with these institutions. I’m sure we will have a good sheet of projects in the next eight weeks which we will then try to bring to the board for approval in April next year. But as of now it’s just a clean sheet of paper. And if we are talking about government influence over bank does any particular government have its own quota for the projects? Typically what would happen is we would look at what is being put on our table, what is ready to go and we would do that. I expect it will be on the basis of sequence, depending on the level of preparation of the projects. As of now we are not talking about any quotas, we will look at all projects that come to us. Now we are on the start. What is the ultimate goal of the bank? Profit making or supporting infrastructure projects? Let us go back to see why this bank was set up. I think the bank was set up clearly to make a position that developing countries are now able to stand on their own feet. Funding needs are large enough and in that there is a need to look at the funding from the point of borrowing. So far the all funding was seen from the point of lender. The lender was from the countries that have the capital, the rich countries. I would say that this bank makes a statement that we can come together and raise our own resources and meet a part of our own growing needs. Of course, we will collaborate with others. And as a banker myself I can say that a project has to be bankable. By bankable I mean that it should be capable of returning the borrowing that has been made and it has to earn return on top of that. The return on top of that can be in various ways. It can be just the interest that is serviced on the loan that is borrowed. Actually it has to be more that that. There has to be return to other stakeholders. So you do a projects which let’s say socially relevant, with a social return that happens as a result. So we need to make sure that those returns happen and people get the benefit from this. We will look at return on a holistic manner, other than the narrow banker’s view – “I get my capital back, I get interest, okay, I am happy”. No, beyond that it has to have relevance to the country that has particular project that we are assisting. So every project we believe will be bankable. From what financial markets your new bank can get debt financing – from European markets, US or Asian? I will start by saying that if you go back to why this bank was set up it was set up in acknowledgement that developing countries are coming of age and that we can raise money on our own. It would mean debt capital also. I think the debt markets in our countries are getting deeper. Clearly as far as the renminbi is concerned, it’s a deep market, the rupee is getting some depth. I’m sure there is local currency depth that is happening. So we will look at the local currency markets in the developing countries, particularly the member-countries, in addition to the hard currency markets. The reason is, we believe that raising local currency de-risks the members from the vast and sharp fluctuations in exchange rates that are happening. So it gives you stability. So will there be some kind of currency basket which will be introduced? Not necessarily a basket. It will be the local currencies of the borrowing members to the highest extent possible which will be used to fund in that country to mitigate the risk. That is our aim. That thought is coming very strongly when we discuss it with governments, with other development banks, that’s something we will be working on. Do you have an idea of how to resolve potential conflicts? Say, when a new loan has to be put up, China and South Africa will have different financial capabilities in providing it. We will come to that when we face that. We are starting on the basis that every member has put up and agreed to a capital commitment. And we will proceed on that basis. And now country will have a veto right for any decision? It will be completely a board-driven process with articles on have the voting process will be done, via majority. Finally, do you think the BRICS might add a few more ‘letters’? Yes, I think in due course we will look at membership, we have to. The timeframe of that I will discuss with the board when it first meets, we are yet to have our first board meeting. We will understand what is in their minds, share our thoughts and proceed. But what new countries do you think can join the bank? I don’t think we should have any pre-set mind, I would give that privilege to the board to discuss. Interviewed by Maxim Filimonov, TASS Editor-in-chief, and Dmitry Medvedenko, Head of TASS Economic & Business News.